On June 2, 2018, I kissed my husband and two children (ages 9 and 13) goodbye in Lansing and flew to Germany for a month to teach a seminar at Ruhr University Bochum in northwest Germany. I was excited for the adventure, but I was also nervous. Though I have traveled in Europe extensively, and I can even speak some German, I had never taught a course at a university outside of the U.S. before. Even though I was going to be teaching in English, I was nervous about being a guest in a department (would I have access to a copy machine? ), the students (would they find my teaching methods unusual or have trouble understanding me? ), and generally about being an American in Europe at this time of political upheaval and tension (would I get non-stop questions about Donald Trump?). Why was I headed to Ruhr University Bochum? The short answer is that the history departments at RUB (the abbreviation for the university) and CMU had been awarded an Erasmus Grant for an exchange of faculty and graduate students over a two-year period. Erasmus grants are funded by the European Commission in order to support student and faculty exchanges across countries. Until recently, these grants were only for exchanges within Europe, but a few years ago, the Commission started offering a few grants between Europe and non-European countries like the U.S. I was the first faculty member to take part officially in our exchange. When I arrived, three M.A. students from our department were already in Bochum and had been there since February. Bochum is in the Ruhr river valley. It is one of a cluster of medium-to-large cities in that valley that make up a large metropolitan area; among the others are Essen, Dortmund, and Duisburg. It is an area of Germany that was very industrial in the nineteenth and twentieth centuries; consequently, it was bombed very heavily during World War II, and it has a reputation for being, well, heavily industrial. The reality is, however, that the cities are quite cosmopolitan—with lots of amazing cultural opportunities like museums and concerts and great food—and the countryside around the cities and alongside the river itself is beautiful. The university campus itself is not beautiful, at least not in a traditional American college campus way. 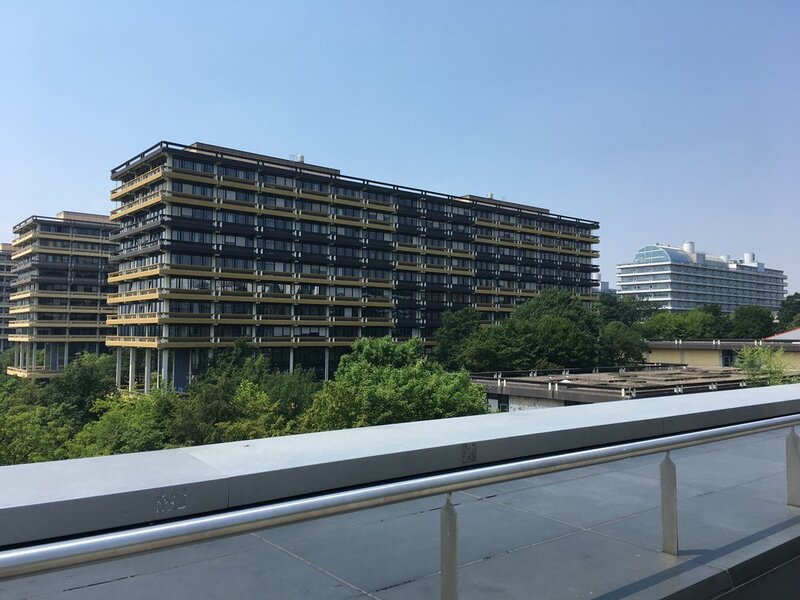 As you can see in the first photo, which features the building in which the history department is located, it boasts a lot of concrete and a definite 1960s look (the university was indeed founded in the 1960s). 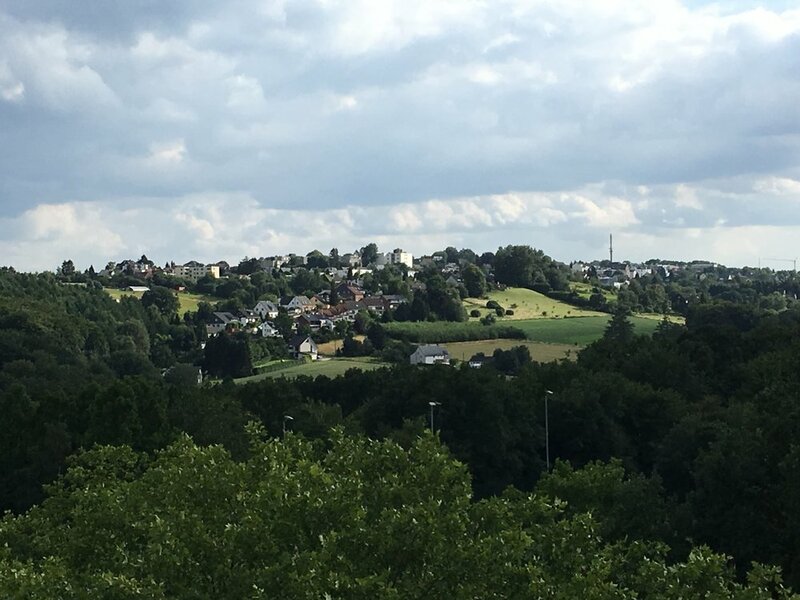 The second photo, however, is taken from the same spot, just after making a slight turn to look out over the river valley and a lovely little town dating from the Middle Ages called Stiepel. In the end, my experience at Bochum was very positive. None of the things I had been nervous about ahead of my departure came to fruition. Happily, no one I met was particularly interested in discussing President Trump. I was given a lovely, newly-renovated apartment with a view of the university and the river valley; it was within walking distance to the university, shops, restaurants, and the commuter train into the center of Bochum (the university campus is located just outside of the main city). I was granted office space and a graduate assistant to do copying for me. I did not have a printer, however, so I was happy that I had loaded up my suitcase with paper copies of the various readings I wanted to assign my students. The course I was teaching was a graduate-level seminar. Bochum’s spring semester runs from April to July, so compressing the course into four weeks in June was not easy, and I only ended up with five students. It was a nice group, however; they seemed very interested in what I had to teach and gave very well-prepared presentations. My topic was “Printing and Print Culture in Early Modern England,” which I had just taught as a seminar in the spring semester 2018 at CMU. The history department at RUB was happy to have an English history topic, because they do not have anyone who teaches British history. I would say that the biggest difference between our system and that at RUB was that, in the end, only one student registered to take the course for full credit, meaning she had to write a long research paper. The others took it for half credit, where all they had to do was a presentation in class. This is something that is not an option for students at CMU, and it took some getting used to. Nevertheless, I was happy to be a guinea pig and get this exchange going, and I believe the three MA students who went to Bochum on behalf of CMU felt the same. In addition to the teaching experience, I had a lot of time to work on my own research and writing—I even took a quick trip to England to do some archival research on my latest project. Furthermore, the exchange is thriving—this fall CMU has hosted Dr. Andrzej Michalczyk from RUB, and next fall Dr. Budrass will be visiting. Hopefully another CMU professor will go in the summer of 2019 or 2020. I will certainly recommend the experience, and I even hope to go back one day myself. These types of exchanges are vital for our graduate program and they certainly benefit both students and faculty enormously.